Most of the chemistry and geology related activities of our stay have been recorded in my other blog, www.elementsunearthed.com, where I’ve given a detailed day-by-day summary. Let me report here the activities which were related to space science and some ideas how you might accomplish similar things in your own classroom. On Monday, March 19, we began our field study by driving out to three locations along Kelbaker Road (between Baker and Kelso Station). 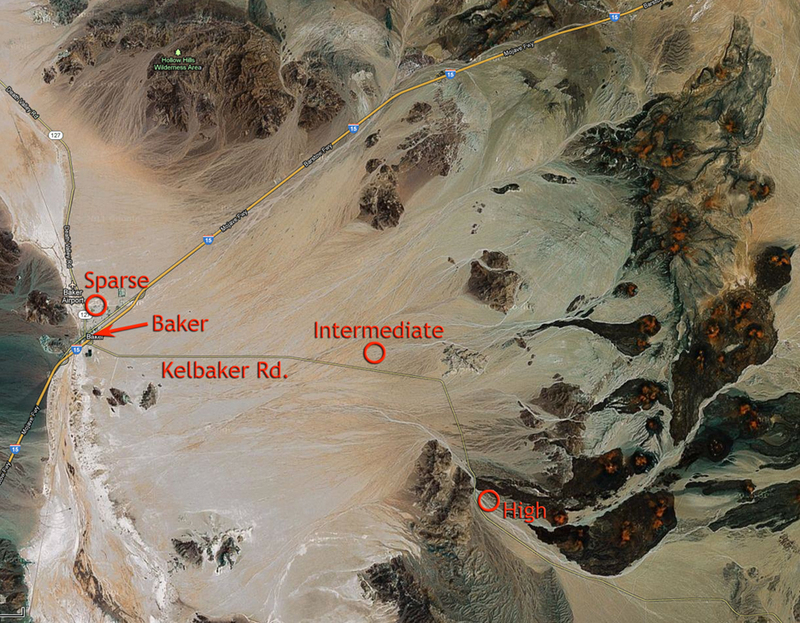 The location closest to Kelso Station was known to have rich soil crusts, the site between was intermediate, and the site closest to Baker was lowest in soil crusts. In addition to collecting samples of the crusts, we sampled the soil beneath and around each site (five samples at each location) and noted each site using GPS positioning. The exact spots had been chosen at random. After dinner, Chris McKay gave a presentation on the Mars Science Lab that I recorded. He gave insight on the objectives of MSL (Curiosity) and how the science instruments will work, as well as how it ties in with what we are doing here. My partner in the SOFIA program, Carolyn Bushman, had a chance to see this same presentation with her students the week before when Chris did a videoconference with them. 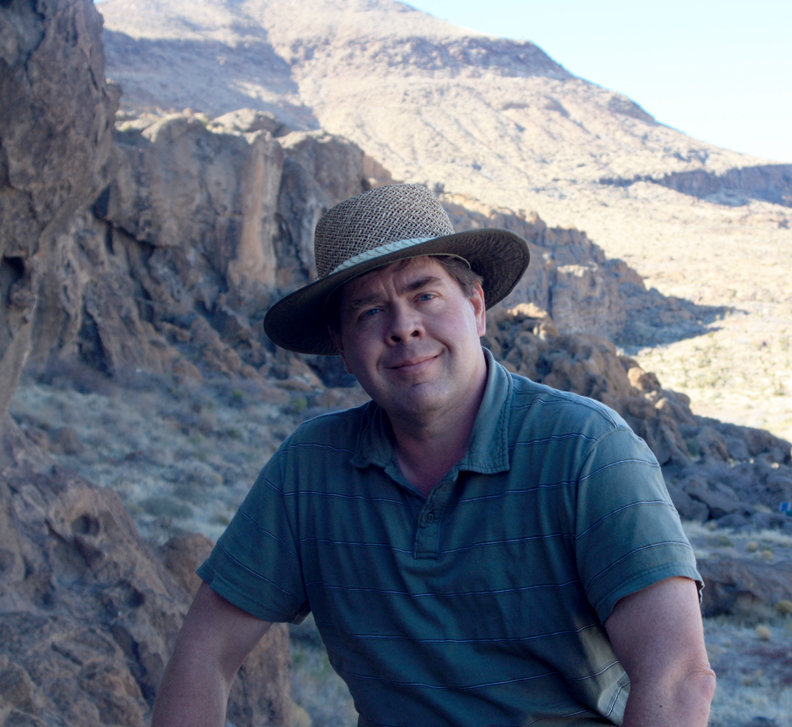 I also had the privilege of personally interviewing Chris McKay about his background and astrobiology in general, which I will add to my next post. I’ll transcribe the presentation and the interview and include them as a Word document link. Wednesday we spent the morning in the lab testing for chlorophyll content in the samples, but took the afternoon to drive out to the Hole in the Wall formation on the southeast corner of the Mojave National Preserve. 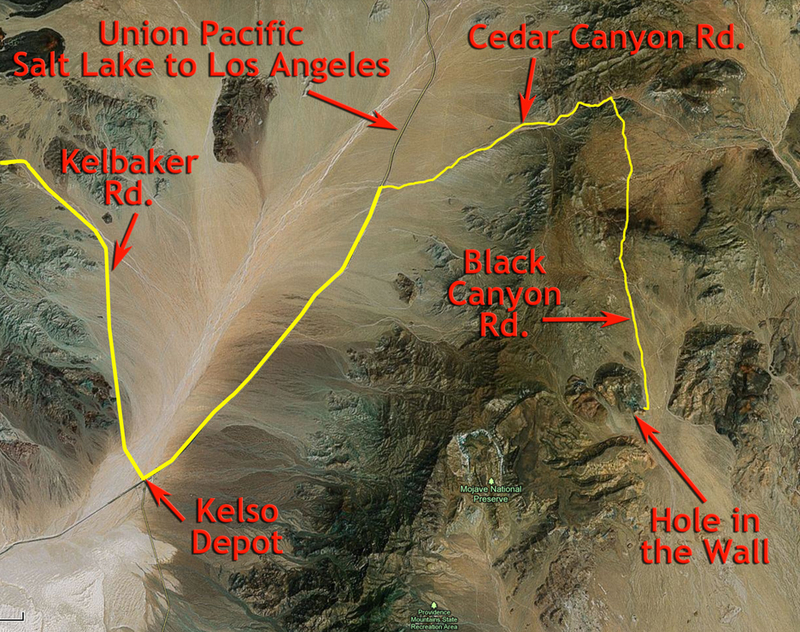 I was sitting in the back of the large white passenger van as we traveled on Kelbaker Road to Kelso Station (an old train depot on the main Salt Lake to Los Angeles Union Pacific line), then turned northeast along the tracks, then east onto Cedar Canyon Road. After missing the turnoff and traveling too far, we backtracked and took the turnoff south to Hole in the Wall. The part through Cedar Canyon was a very washboarded gravel road, and sitting in the back of the large van gave me quite the spinal massage. 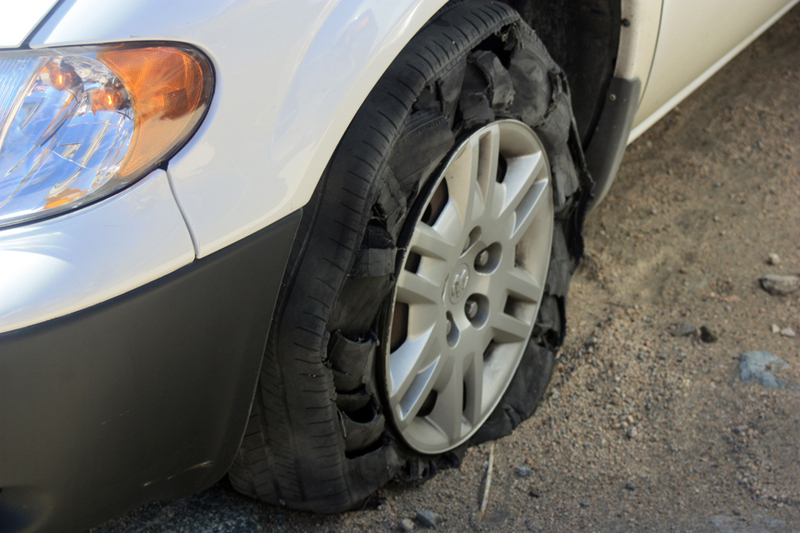 The road was so bad that one of the rental cars literally shredded a tire. I’ve never seen one so utterly destroyed. 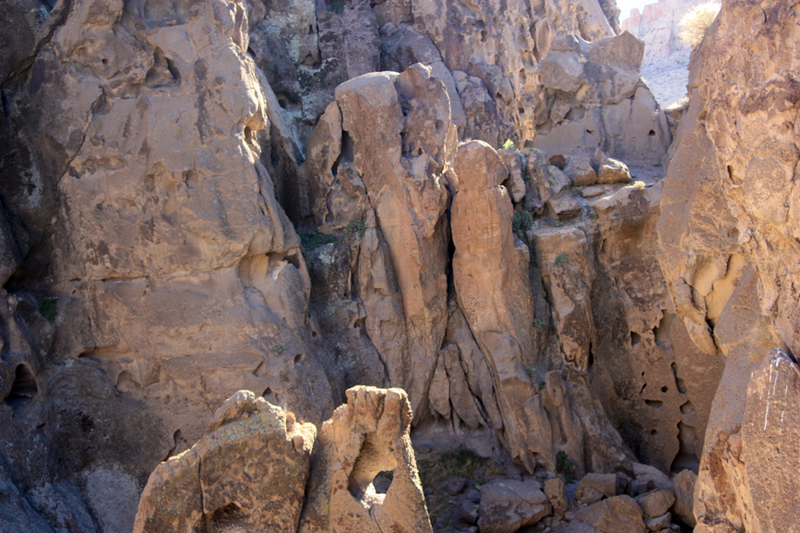 Hole in the Wall is a formation of rhyolite similar to that found at Topaz Mt. in Utah. Vugs and holes in the rock have now eroded into fantastic shapes. 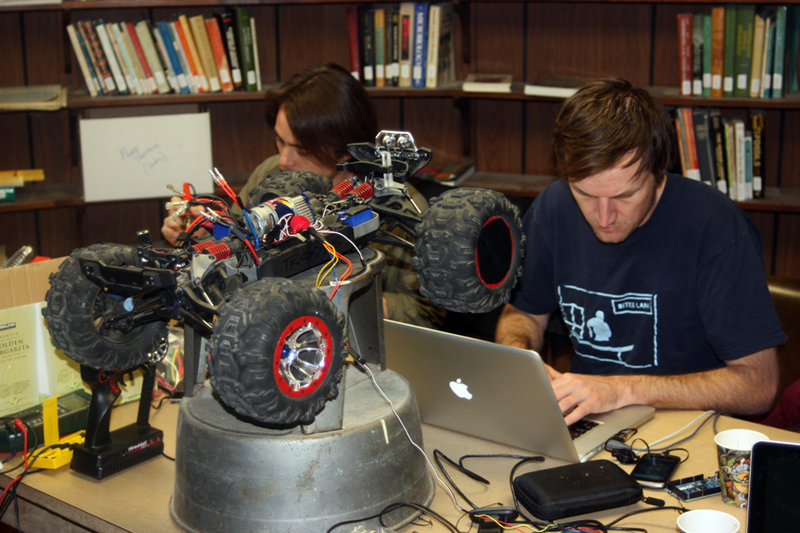 While we were there, Geoff Chu and crew tested the mobility of the rover using a laptop and local wireless network to send control signals through the Arduino. 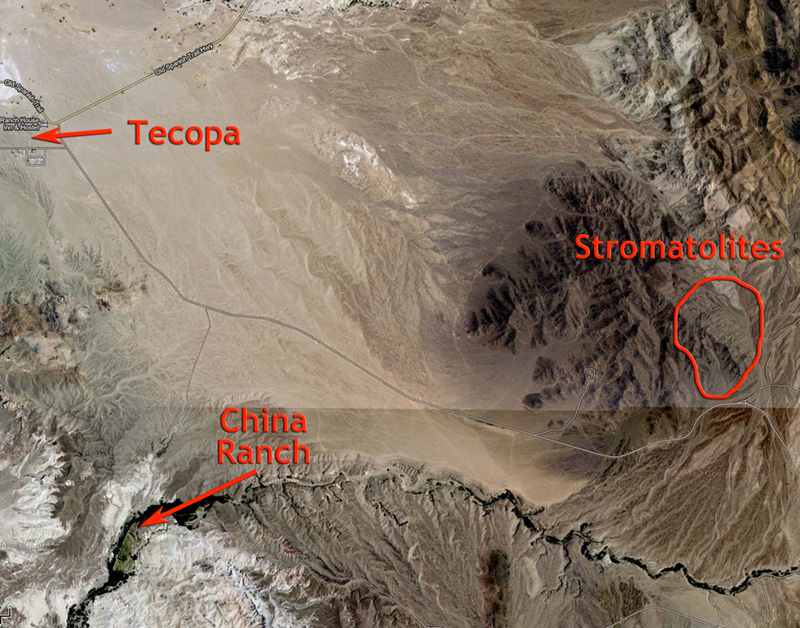 Thursday morning we studied the substructure of the soil around Zzyzx Road, as discussed in my other blog. 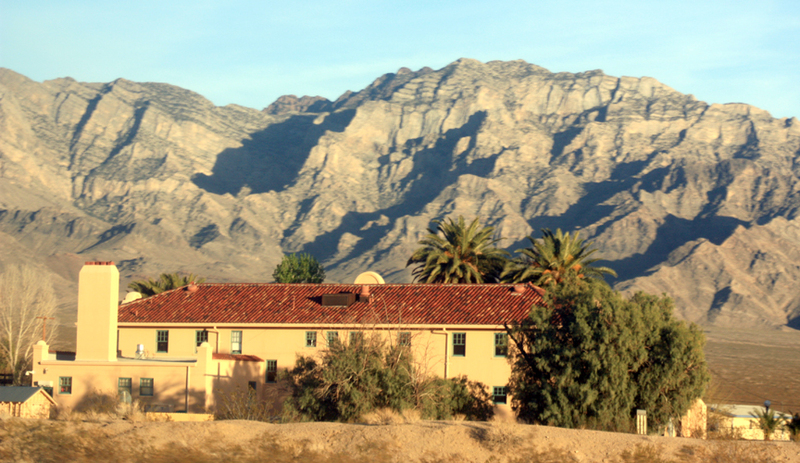 In the afternoon, Mary Beth drove the van and Rosa drove her car out beyond Baker to look for a site she knew of where there were two billion year old stromatolite fossils. 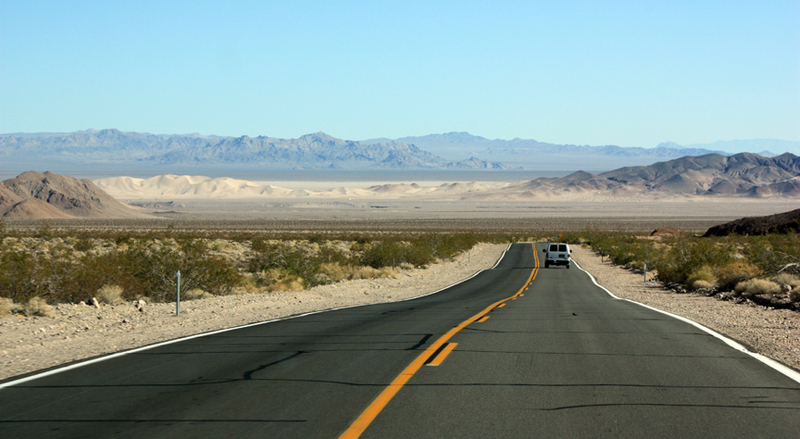 We drove northwest on State Road 127 from Baker for about an hour, then turned east onto the Old Spanish Highway to Tecopa. 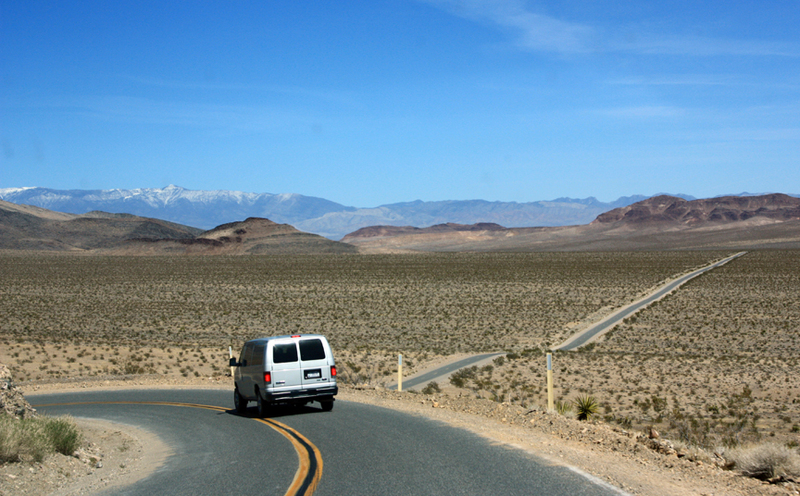 We accidentally traveled too far into the next valley and would have wound up in Nevada, but we turned back and found the gravel road leading east out of Tecopa (shown as Furnace Creek Road on the map). We didn’t find the exact spot where the best fossils are, but we did find some (although they were so metamorphized that they could just as easily have been layered schist). We stopped at China Ranch for date shakes (quite good) before heading back. This whole excursion makes me think of how difficult it will be to find evidence of life on another planet. Here we were on Earth having trouble telling the difference between schist and stromatolites. Any organic materials were long gone, regardless, after two billion years. After having been buried, squeezed, partially melted, uplifted, eroded (and a few other things besides) it becomes hard to tell a fossil from any other rock around it. If we find some type of reaction in soil samples on Mars, how do we know it is life or just some sort of exotic soil chemistry brought on by the unique conditions of the planet? That was the major problem with the Viking timed-release experiment in the 1970s: according to the standards set for the experiment in advance, it did detect life signs. But perhaps the standards were wrong to start with. The controversy is still going on. Mars Science Lab might find similar results – not clearly life signs but possibilities. The only real way to know for sure is to get samples back to Earth for rigorous examination or to send biologists and geologists to Mars to study samples in situ. 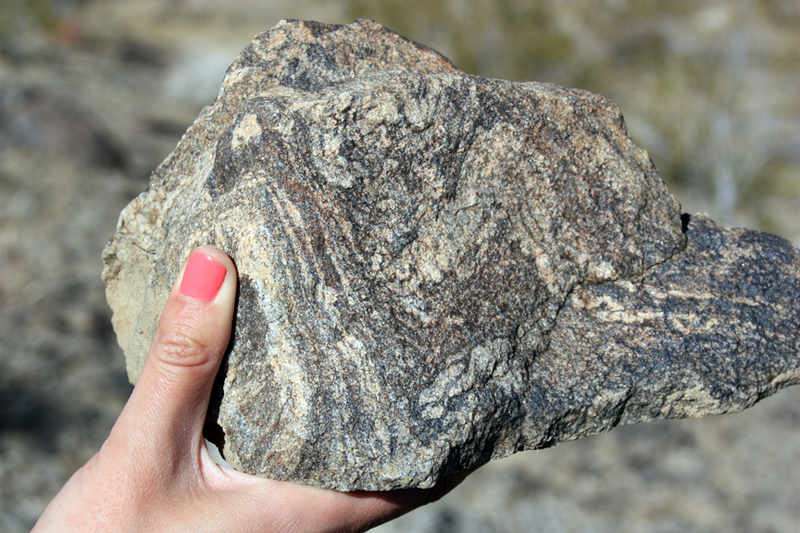 Stromatolite fossil near Tecopa, CA. After returning for supper at 5:00, we did a final outing to our soil sites on Kelbaker Road to gather data with the rover. It was the evening of the equinox, and the sun set directly behind Baker as we returned to first the Intermediate and then the High locations. The rover’s IR camera collected data from each site at these two locations, but they had to put a frame around it and hang cloth from it to prevent the setting sun from interfering with the IR data, while still having enough light for the imaging camera to work. Afterwards, back at the vehicles, I had the fun job of leading a star show. Out here in the desert the stars are very bright, and with Jupiter and Venus lined up in the west and Mars going through retrograde motion in the East, with the winter constellations still in the sky, it was an ideal time to do a star show and better than any planetarium. I borrowed a green laser pointer and led the others through the constellations, stars, and planets that were visible. For me, this was the highlight of the whole trip (although I have enjoyed every part of it). Dr. McKay was in Las Vegas, so I was the next best star expert (which surprised me, but most of the others were biologists not astronomers). On Friday morning, after launching a weather balloon, we reported out our findings. I helped Mary Beth to talk about the soil chemistry, and also showed my sample 3D images from a test we did of the IR camera on Tuesday night and explained how my students will model the data. I look forward to seeing the final results after the lab tests come back. I also interviewed our project leader, Dr. Rakesh Mogul of the NASA Office of Planetary Protection, before we all took off for our separate destinations. Kelso Depot on the Union Pacific Railroad, Salt Lake to Los Angeles line. 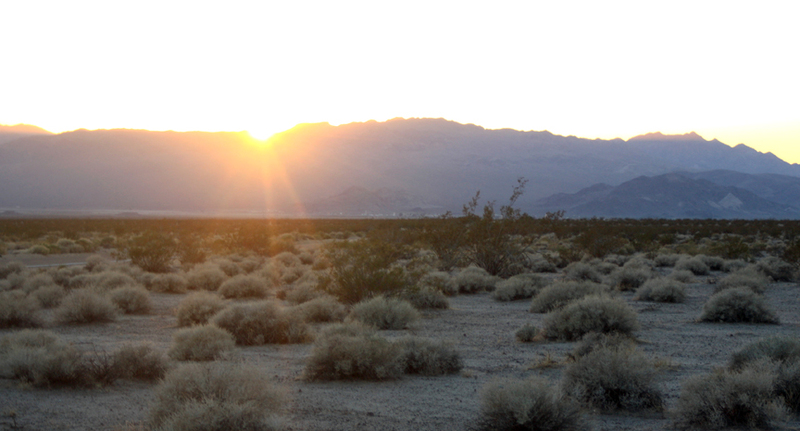 As a final note on the Mojave experience, here are some lessons I learned about setting up and running a field research study. As a science teacher, I fully believe we should get our students into the lab as often as possible and even get them into the field to collect data which can be brought back to the lab for analysis. Students should become scientists instead of just learning about science. That is why I proposed a project out in Eureka, Utah to study how well the EPA superfund cleanup has actually remediated the soil contamination there. It will get my students out asking questions, collecting data, analyzing the samples, and drawing conclusions, just as real scientists do. The American Chemical Society will provide $1500 for this project. Use multiple forms of testing, including tests that can be done on the spot (we had a field ATP analysis kit, for example, that would give results within a few minutes). We also had a more accurate laboratory version that could be done in the lab ourselves the next day. We also sent in samples to a third party lab, which takes longer and costs more but should be the most controlled and accurate test. The purpose for this is to be able to compare the data. Since you can only afford to send a few samples away, comparing the same samples analyzed in the field and in the lab with the ones sent away provides a confidence baseline for your tests; assuming you conduct all your tests the same way, you can draw conclusions from your field and lab analyses as they correlate with the ones sent away. For the Tintic project, we will collect samples from many sites but send four of them in to a lab for detailed elemental analysis. We’ll correlate those results with the ones we conduct using more qualitative tests in our own lab. Some of these we’ll do directly at Tintic High School so that we can go back out and collect more samples if needed, and other we’ll bring back to Walden School for more careful, quantitative analysis. Piggy-back several research projects into one field study, yet keep each one simple. Setting up field research is difficult to get the logistics right and is expensive to conduct, so you want to hedge your bets. In case one project doesn’t pan out, have others going at the same time. We had the main analysis of the soil crusts as our overall project, but the rover tests, the soil trenching study, and other smaller projects gave us additional things to do and more chances for a publishable result. For the Tintic project, we will be documenting the history of the superfund clean-up and the town in general, collecting photos before and after the clean-up to show how the history/look of the town has changed. If the soil study itself doesn’t provide any good conclusions either way (which is always possible in science) then we’ll have the history project as a backup so that the whole study won’t be a total loss. Advanced planning is important, but so is flexibility. In the field, we had definite teams put together for various parts of the project, planned out in advance. The teams were fluid enough so that as we moved through different phases (collection to analysis to drawing conclusions) the teams shifted and people were able to help out where they were strongest. I’m not a biologist, so I didn’t help with the ATP or DNA studies, but I do know some geology and chemistry and was able to help with the soil analyses, as well as act as a documentarian to photograph and videotape the project. We’ll need the same type of fluid team structure for the Tintic project, with collection teams and as much advanced training as possible, including setting up and practicing collection and testing protocols. Control of variables is much harder in the field. You can try to isolate and identify all the variables of an experiment in the lab, but in the field anything can affect the outcomes, such as the time of day a sample is collected (our ATP tests seemed to show that ATP increased during the day in the crusts and was independent of location). We also had an unexpected cold front go through the day before, so temperature may have affected things. It got warmer as the day progressed. You’ve got to know your field locations well, scouting them out in advance so that a good plan of action can be set up as well as thinking through anything that might change the outcomes of the test. Procedures such as taking multiple samples from each location and practicing procedures beforehand are very important. Document everything and label everything. Set up an agreed-upon naming system for sample collection. We used one that was a bit hard to remember: High, Intermediate, and Sparse for the three soil crust sites. I have had a hard time remembering the “sparse” designation. High, medium, and low seems better to me as it is a more internally consistent nomenclature. By documenting everything and putting it on videotape and photographs, we can remember it better. Here it is summer and we are months beyond the Mojave study and without my photos I’d have a hard time remembering who did what or exactly what steps were taken in what order. Have a plan in place for reporting results. It’s good to report initial results to get a feel for where the data is going while the study is still taking place and there is time to make corrections. But keep in mind these results are preliminary. Also have a long-term plan for how to finish the project and make final conclusions and publications. We had to send samples away to a lab, which meant waiting several weeks for the final results, then writing up the conclusions. By then, all the students were back at their own schools. Staying in touch and pushing through to finish the study are important, and are usually the hardest parts. It will be very difficult to try to finish up the Tintic study unless we get it done before school ends in May, and better yet if we can make conclusions by the end of April, 2013. There are many more lessons to be learned, such as keeping things simple and not biting off more than you can chew (or get done in a school year while still teaching your core curriculum). Many teachers shy away from field research or even doing labs because it seems to take away from the core knowledge the students have to regurgitate on final tests. It also takes a lot of work, and some teachers just don’t care enough to put in the effort. But with some creativity and careful management, field research and inquiry labs can actually help meet state objectives more efficiently than standard lectures. I’ve seen entire schools that have moved to project-based learning and their students not only do well on state tests, they are more energized and excited about science. I hope to move in that direction. I teach courses in multimedia, 3D animation, Earth science, physics, biology, 8th grade science, chemistry, astronomy, engineering design, STEAM, and computer science in Utah. I've won numerous awards as an educator and am a frequent presenter at state and national educator conferences. I am part of the Teachers for Global Classrooms program through the U.S. Department of State and traveled to Indonesia in the summer of 2017 as an education ambassador. I learned of the Indonesian education system and taught classes in astronomy and chemistry at a high school near Banjarmasin in southern Borneo. I am passionate about STEAM education (Science, Technology, Engineering, Arts, and Mathematics); science history; photography; graphic design; 3D animation; and video production. This Spaced-Out Classroom blog is for sharing lessons and activities my students have done in astronomy. The Elements Unearthed project (http://elementsunearthed.com) will combine my interests to document the discovery, history, sources, uses, mining, refining, and hazards of the chemical elements. This entry was posted in Uncategorized and tagged astrobiology, baker california, china ranch, chris mckay, csu desert studies center, curiosity rover, field research, hole in the wall, kelso depot, life on mars, macrobiotic soil, mars rover, mojave desert, mojave national preserve, soil crust, stromatolite, zzyzx road. Bookmark the permalink.